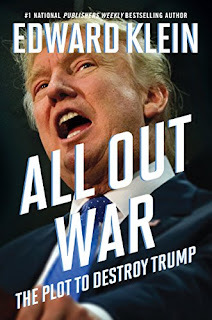 Punditeer: My Review of Edward Klein's Book "All Out War: The Plot to Destroy Trump"
My Review of Edward Klein's Book "All Out War: The Plot to Destroy Trump"
President Trump faces an army of enemies on the political Left and Right, all warring against a democratically-elected president they feel is unworthy of the office. Edward Klein’s book draws on interviews with many players who provide new enlightening information on the unprecedented war waged against a President of the United States. But Trump is no easy opponent to defeat. As Klein says, his enemies always underestimate his ability to bounce back after a beating. Trump’s vanquished opponent, Hillary Clinton, suffered from medical issues that were hidden as much as possible from the public. If they had been revealed, it was believed they would have derailed her campaign. Klein reveals Hillary’s scary coughing fit while visiting President Obama and his wife in the Oval Office. A White House doctor attended to her while the Obamas waited outside worried for her health. The Hillary they saw in the Oval Office wasn’t the same one shown to the public at rallies and the debates. Klein includes the text of an FBI field report on the various Resistance groups and figures, published for the first time in this book. Concern was raised on their penchant for violence and government sabotage. Meetings were held where government workers discussed sabotaging Trump programs they disagreed with. Violent anti-Trump street demonstrations were paid for by Democratic party operatives. The impeachment crowd has been among the loudest of Trump’s enemies. Klein lists the charges against Trump and dismisses them all: that Trump obstructed justice by firing James Comey, the director of the FBI; that Trump violated the Constitution by receiving profits (“emoluments”) from foreign officials who stayed at his Washington DC hotel; that Trump colluded with the Russians during the presidential campaign; that Trump is somehow “incapacitated” and therefore the 25th Amendment should be invoked whereby the vice president will replace the president. All of these arguments fall short and the only hope Democrats and Never Trumpers on the Right can hope for is a thundering Democratic victory in midterm elections in 2020, giving the Democrats a majority and some hope of impeaching Trump. Curiously, President Obama hasn’t been much of an enemy to Trump since he left office. He has little stomach for such things. Klein reveals that Obama has returned to smoking marijuana. He smokes weed once or twice a week, supplied to him by friends who visit his mansion in Washington DC. Klein portrays Obama as a man who has left politics behind. He plays video games all day and is behind in the writing of his memoirs, for which he is being paid $60 million. The intelligence community boasts many anti-Trump Obama holdovers. The resignation of National Security Advisor Michael Flynn was seen as a major victory for the resistance movement. Flynn’s ouster was a soft coup, Klein says, engineered by anonymous intelligence community bureaucrats. James Clapper, former Director of National Intelligence, proved himself to be a liar on several occasions. Trump’s presidency was beset with numerous leaks, many originating directly from the US intelligence community. The pool of leakers was vast, Klein explains, because Obama had lowered the security classification of sensitive electronic intercepts targeting the Trump campaign, allowing thousands of government workers access to potentially defamatory information. Among Klein’s prime “Leakgate” suspects: Former CIA Director John Brennan, and Hillary Clinton, who was given access to much of the leaked information. FBI Director James Comey had agreed with Trump that the intelligence community was packed with Obama holdovers intent on delegitimizing his presidency. Klein reveals that Obama privately attempted at least twice to influence the outcome of Comey’s investigation of Hillary Clinton. Comey blew off Obama, who then discussed ways to remove Comey from office with Valerie Jarrett. He was talked into believing it would be politically feasible to remove Comey, but Obama dithered and never pulled the trigger. Obama moles were planted in the FBI and are still there one year into the Trump administration. Comey intended to fire those he suspected of disloyalty, but before he could, Trump fired him. Andrew McCabe, the deputy director of the FBI, had long coveted Comey’s job for himself. McCabe stabbed Comey in the back and talked against him privately, which Comey never suspected. Comey took revenge on Trump by leaking a conversation where Trump asked him to swear his loyalty. The eventual result was the formation of a special counsel to investigate Trump, headed by Robert Mueller. Comey’s actions revealed him to be a member of the Resistance, a Never Trumper, a man without honor, not the nonpartisan he claimed to be, Klein concludes. The FBI, Klein says, is concentrating on the Resistance groups that are committing acts of violence and plotting more. The FBI discovered collusion between American anarchists of the Resistance and foreign terrorists, such as the Islamic State. “The internet chatter between the Americans and the Islamists is astronomical,” said an FBI source. The portrait painted by Klein is a Washington DC dominated by Swamp creatures intent on destroying any outsider like Trump who attempts to set the nation back on track and reduce their power. It’s Trump in a war against the Democrats and the GOP Establishment who want to maintain the odious status quo. To what extent can an outsider like Trump succeed? Nothing seems certain at this point, though Klein believes that Trump will at the least finish his term in office. Highly recommended.